Can the Chinese firm deliver style and substance? 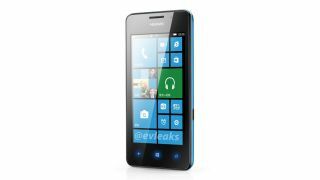 Is this the second Windows Phone 8 device from Huawei? The Huawei Ascend W2 has popped up again and this time instead of a blurry snap shot we've been treated to what looks like a press image of the Windows Phone 8-toting smartphone. This latest leak comes from the oft-reliable @evleaks, who provided the picture along with the words "Huawei Ascend W2, 2013" - and nothing more. What this means is that apart from knowing that the Ascend W2 will likely make an appearance sometime this year. Details on specs, release date and price are still a relative mystery. Previous reports have suggested the Ascend W2 will sport a 4.3-inch 1280 x 720 display, 1.5GHz processor, 1GB of RAM, 2000mAh battery and an 8MP rear camera with 1080p HD recording. If the press shot does transpire to be true then Huawei may be onto a winner as the Ascend W2 looks set to be an attractive smartphone, with a definite design upgrade from the toyish Ascend W1.